Close-up of probe tips for ring resonator experiment. For nearly a century, the instrument of choice for accurate temperature measurements in the range relevant to manufacturing and biomedical applications (–190 °C to 962 °C) has been the standard platinum resistance thermometer (SPRT). Indeed, in the International Temperature Scale of 1990, the International Bureau of Weights and Measures specifies an SPRT as the authoritative device for measurements in that range. 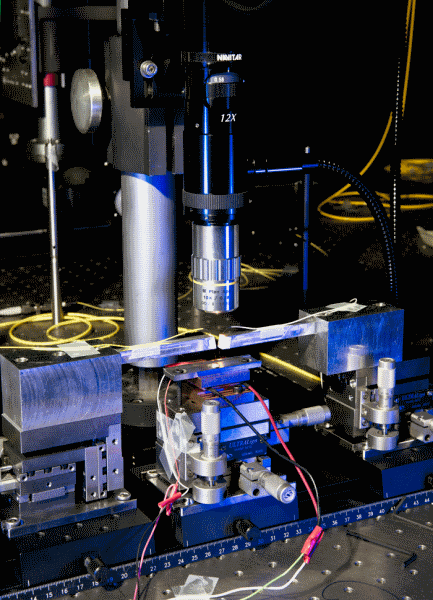 But if a project centered in PML’s Thermodynamic Metrology Group is successful, NIST will be able to provide metrology support for a new generation of photonic temperature sensors that offer numerous potential benefits over the venerable SPRT, including lower cost, easier fabrication, far less demanding calibration requirements, rugged construction and tolerance for harsh conditions, small dimensions, resistance to electromagnetic (EM) interference, and remote telemetry. In addition, photonic sensors are readily adaptable to measurements of pressure and even humidity. Recently the project created a first proof-of-principle prototype of a ring-resonator thermometer (see below) with accuracy equivalent to that of an SPRT. Subsequent research, the group hopes, will result in another order of magnitude improvement, and more importantly will establish optical sensor devices as a viable successor to current standards. The research team, which includes members from the Joint Quantum Institute at the University of Maryland, is proceeding in stages simultaneously on two different kinds of photonic devices. The first employs fiber Bragg gratings (FBGs), tiny structures made axially inside an optical fiber by locally modifying the fiber structure such as to create alternating layers of material with different refractive index. The FBG reflects certain wavelengths while letting all others pass. As the temperature around a FBG changes, it affects the device’s thermo-optic properties, which in turn change the wavelengths it reflects. Similarly, pressure changes cause dimensional changes in the grating, which alter its optical properties. Thus FBGs can be used as sensitive detectors of temperature and pressure. The second sensor type under investigation in the project is based on a ring resonator: a closed loop of total-internal-reflection waveguide, about 10 micrometers in radius, placed adjacent to – but about 100 nanometers to 200 nm away from – the main optical fiber. 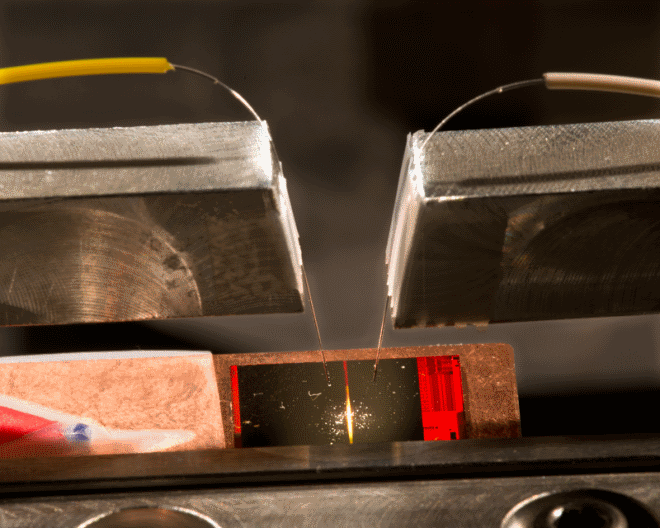 The resonator will capture or “absorb” wavelengths propagating down the fiber from a laser source if the wavelengths are resonant with the optical properties and dimensions of the loop. Because temperature directly affects those properties and dimensions, the device can serve as a temperature sensor. “It’s first-principles thermometry,” Strouse says, “measuring how Brownian motion changes and modulates the wavelengths that pass.” The effect has been observed by a few other research teams. But evaluating its suitability as both an industrial and reference thermometer is a long and painstaking process. The PML project will have to determine the optimal configuration and materials, discover how various impurities affect performance, identify sources of quantification errors, and confirm that a given design is stable over time, across temperature ranges, and through numerous repeated cycles, among other tasks. Were that not enough of a challenge, the PML researchers also want to find a way to integrate the laser source, ring resonator, and data output component onto a single platform that could be made with available nanofabrication technology used to produce microelectromechanical devices. “What we want to end up with,” Ahmed says, “is a low-mass thermometer that is very small and very accurate which could easily be deployed in the field.” Ideally, the device would also be self-calibrating. Laboratory apparatus for the ring resonator experiment. Click here for animation of how the ring resonator is used as a photonic thermometer.